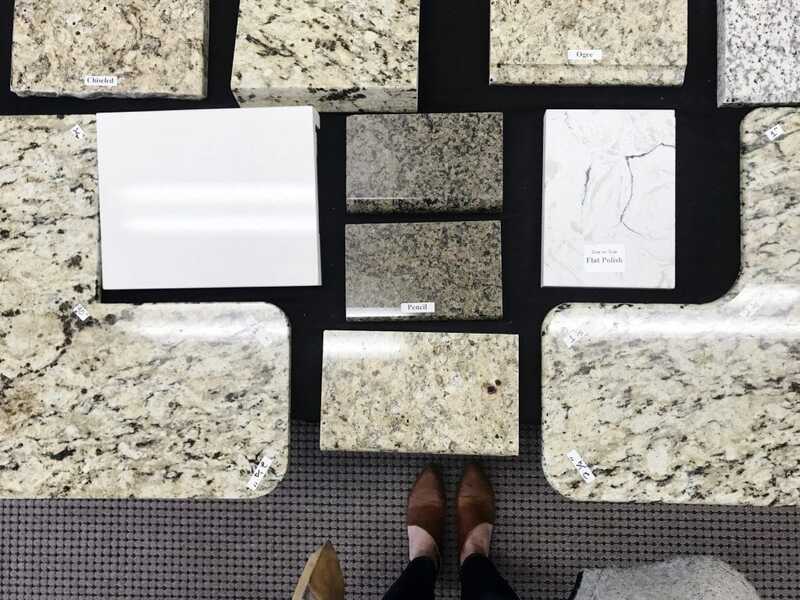 Confession: We’ve never shopped for stone for countertops–ever. It has always felt like this super expensive, intimidating process. 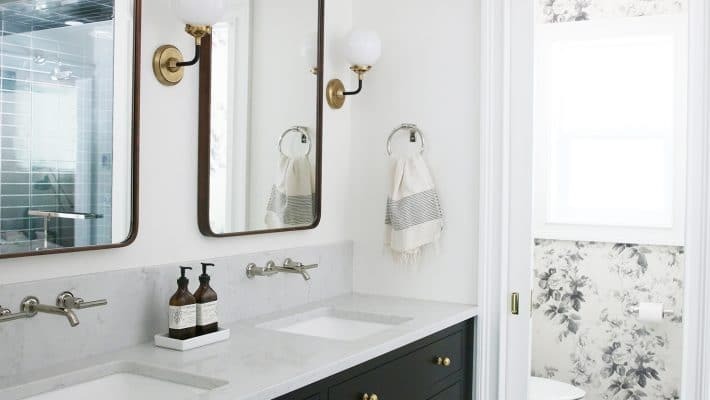 But for our bathroom, we’re trying to do a lot of things we haven’t done before: hire a contractor, shop for stone, design a custom vanity–and it’s exciting! 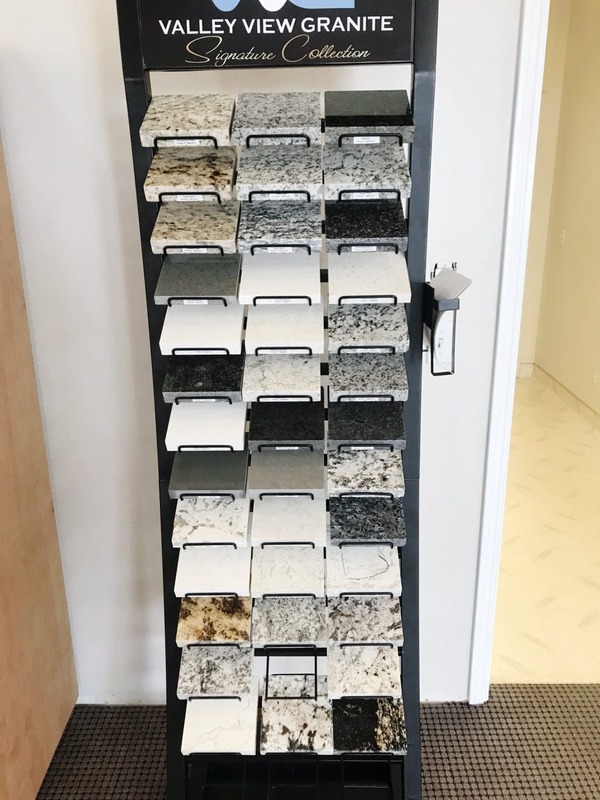 The first task in picking out our stone was actually designing our vanity–which is why we took you through that project over the last two weeks. I guess technically you don’t have to, but we wanted to be able to get an accurate bid and the vanity has to be in place before the stone can get fabricated and installed anyway, so that’s the natural first step. I mentioned in Friday’s post, we decided to go with option 1 (from this post), but we did tweak it a bit. We changed it from a 72″ vanity to an 80″. That allowed us to put some thicker spacing against the walls, without making the drawers too big, so our elbows had more wiggle room while getting ready. This also gives us the opportunity to mount wall sconces on either side of our mirrors. At 72″, everything felt scrunched and we were mocking up over-the-mirror lighting options that I wasn’t so excited about. And then it hit me–we’re doing a custom vanity, we can make it bigger–we have the space! I talked before about how sometimes you don’t know how to do because you simply because you have not done it before. Buying a house comes to mind. That feels hard and huge. And then you do it and it’s like, Okay. I know how to buy a house now. That’s how shopping for our countertop was. It felt like it was going to be really difficult and confusing and it really wasn’t. Our contractor tipped us off to a few stone yards in the area and there was one he highly recommended because they sold their signature stone by the square foot, which apparently is not very common. 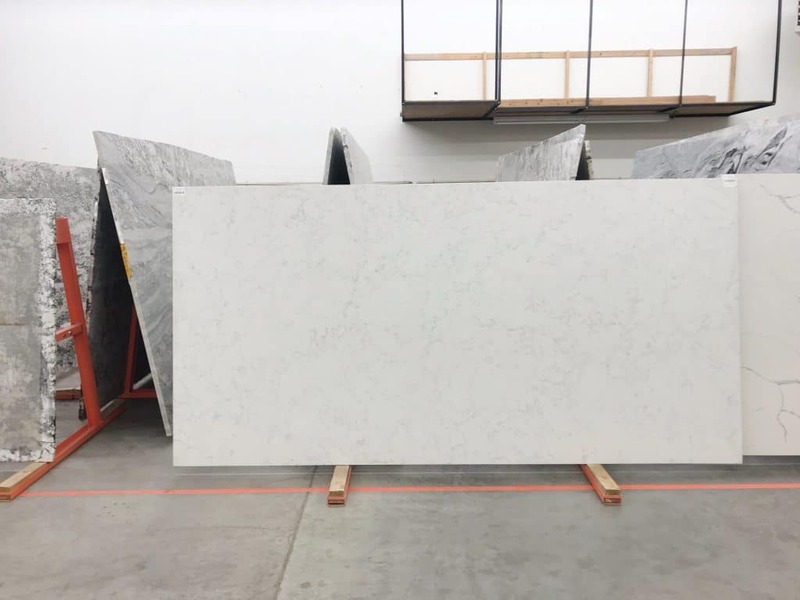 Unless you are lucky enough to come across a remnant that fits your project perfect, you are generally obligated to buy the entire slab of stone and have it fabricated to fit your space. 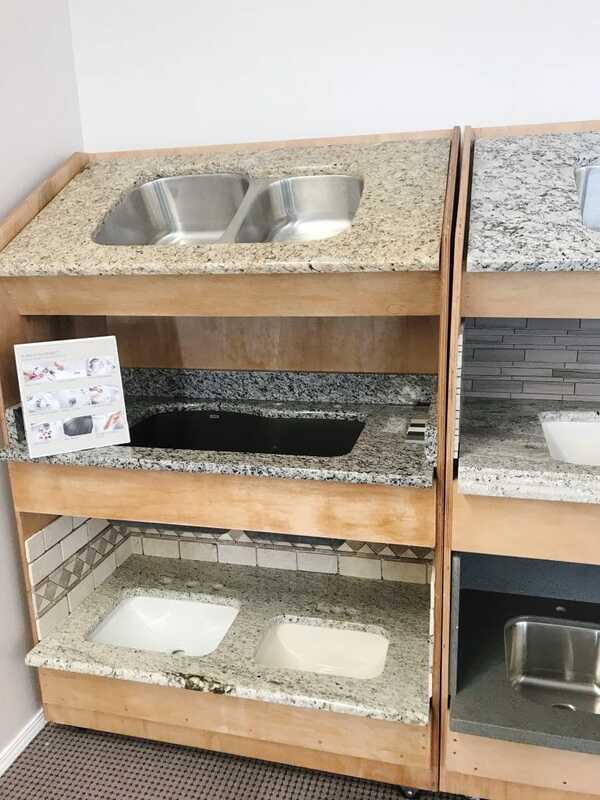 We went to Valley View Granite (I’m pretty sure they have multiple locations) and they have their own stone line in house that allows them to, instead, sell it by the square foot which means lower prices and less waste. We checked out their collection first, hoping we’d LOVE one so we could save money–haha. Although it says, “granite”, they also carry quartz and the prices went up the closer to the floor you got. The one we ended up really liking was the one on the far left, 4th from the bottom. That’s it in a large slab version so we could really see how it moved. It’s called their “Venato” quartz. 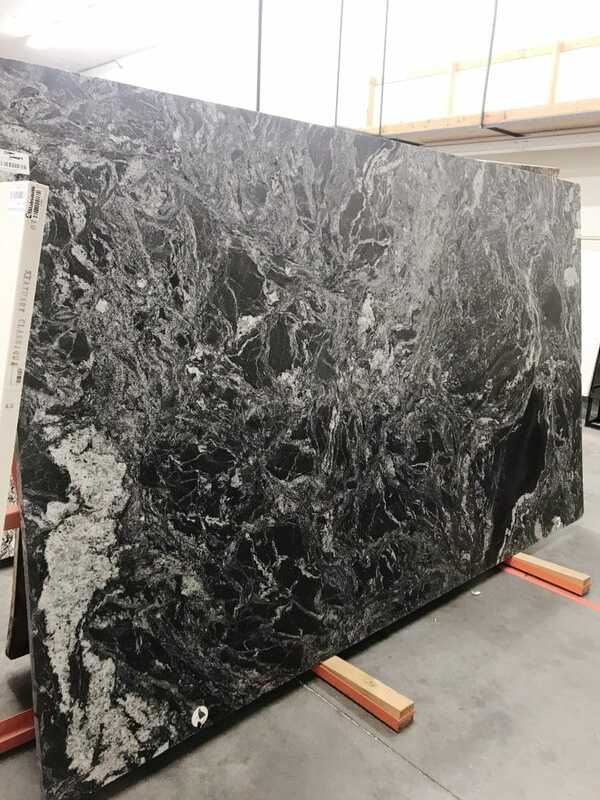 While we were there, we also fell for this raw black granite that, and are already thinking of using it in the cabin’s kitchen. After we decided on stone, we picked the edging around the sink (some are very rounded, we went with a pretty clean edge) and the edge of the counter–where we decided on Flat Polish–the cleanest edge again. Before we left, they wrote up two quotes for us, the first was the counter + 4 inch backsplash on 3 sides. 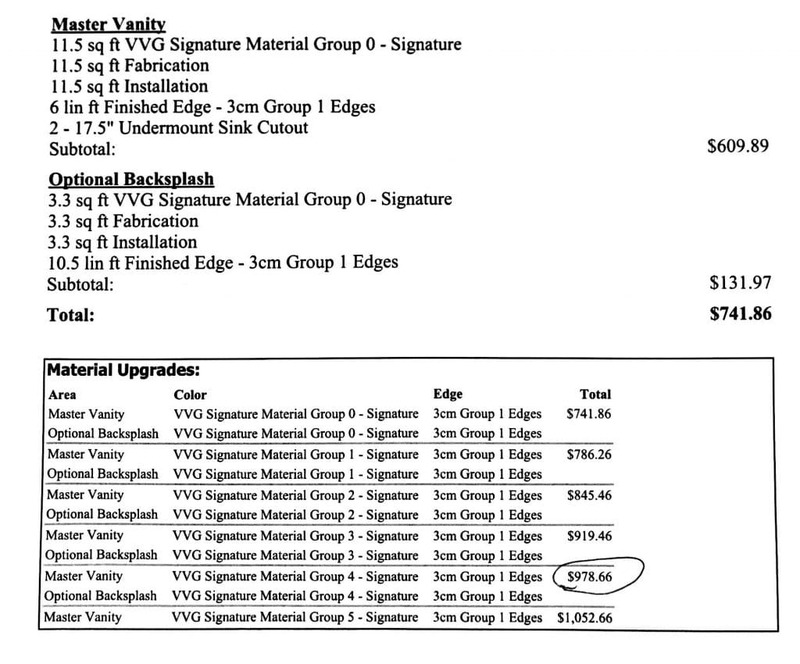 The total for that would be $978.66 (because the stone we chose was in their material group 4 price range). 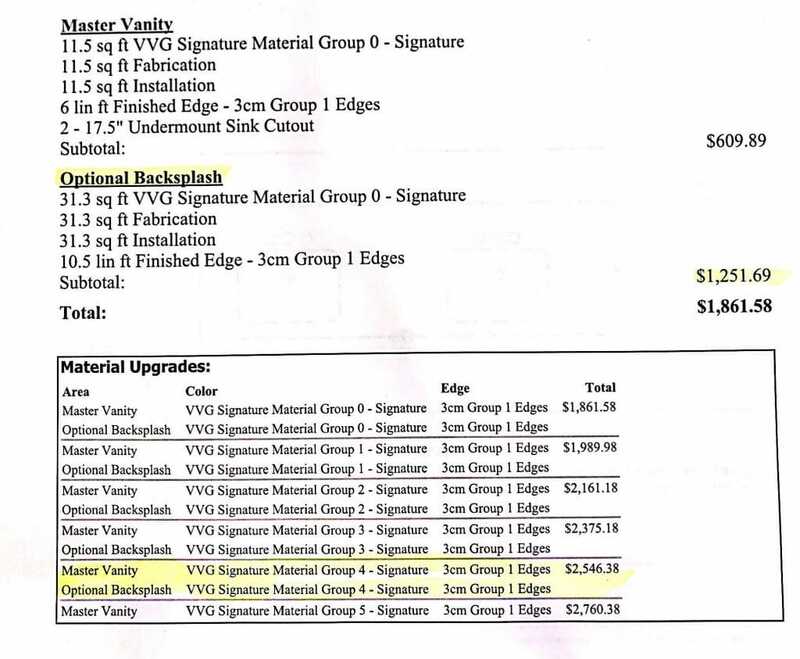 We, also, for fun, had them write up a quote for the backsplash being carried all the way to the ceiling–which ended up being $2546.28! The countertop will be one of the last things installed, but we had to get it all nailed down now and it feels good! 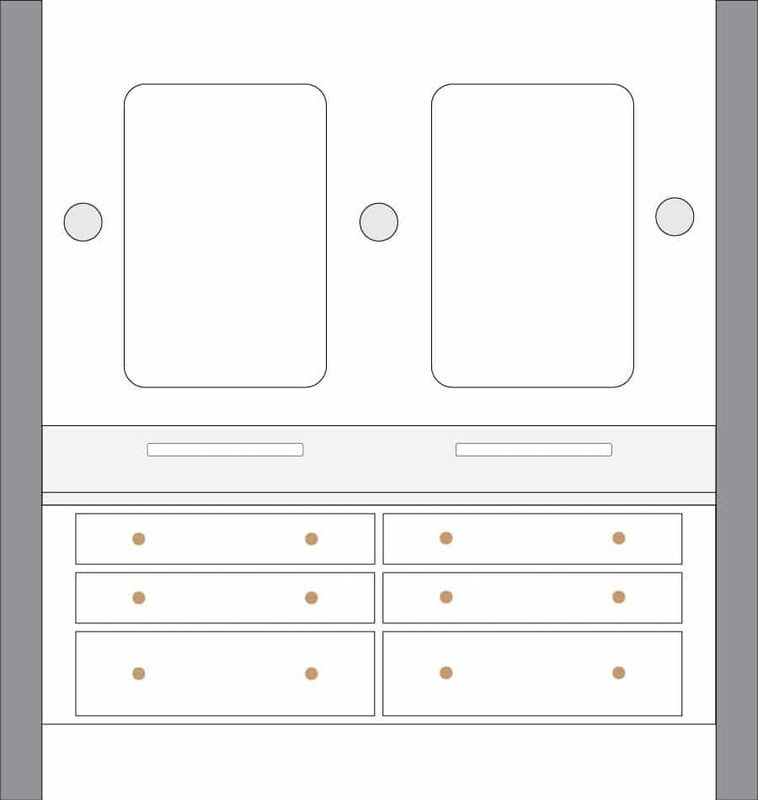 Once the vanity is hung, they’ll come and template the counter and it could take anywhere from 5 days to 2 weeks to be delivered and installed from there. With the countertop set in stone (I’ll wait), I think I have the whole mood board put together. We’ll share that with our next update! Absolutely stunning! You have such great vision/talent. I was wondering if your price quote included installation? We used Venato Quartz for our wet bar – it looks great! Can’t wait to see the finished bathroom. I’m not sure if this is unusual in other areas, but where I live in KY, all the fabricators and stoneyards let you pick the full slab but you only pay for what you actually use. That way, you can pick the specific parts of the slab you want used (to avoid stains, mismatched veining, etc). 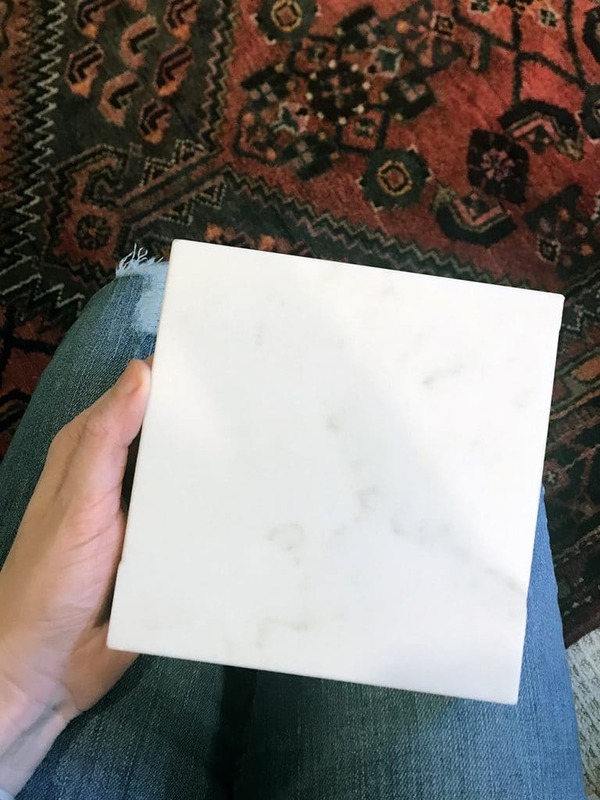 I am an interior designer in Charleston, SC and all the local stone yards (excepting one called like bargain stone) require you to buy a full slab of most things. Sometimes they let you buy half a slab. 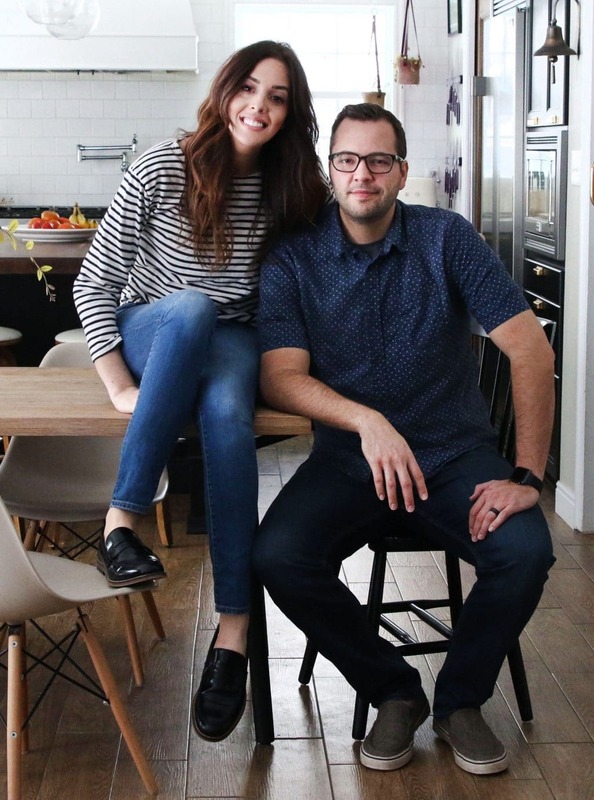 Lowe’s, Home Depot, some other kitchen and bath places around have limited options that’s you buy by the square foot. That black and white quartz is beautiful, but I would avoid it for a kitchen. Any countertop with a ton of pattern disguises food mess so much. I keep my kitchen super clean, but I can’t tell you how many times I’ve found crumbs or a drop of alfredo sauce on the counter after cooking and wiping everything down! Yes! It is so frustrating to never feel like your counter is clean. We just put a very similar quartz in our kitchen and … IT’S JUST SO PRETTY. It’s going to look perfect with your black vanity. Love the direction you are going with your master bath! Question – related to your last podcast (which I’ll miss!). You mentioned that you would probably only be in your house another 5 years or so. Wondering if you would consider a blog post on how you decide on the finishes if you plan to move on eventually and if you think you’ll ever have a forever home? Asking from the perspective of someone looking to move because our current home just doesn’t fit our families needs but were close to extended family (which I know you are to) and it makes the process harder to find something that we see ourselves in long term without giving up our location. What is your thought process/goals etc.? We love our home and where we live and especially who we live next to, but we’re open to moving in the future just to explore other areas of the country. You don’t need to move to experience other areas. If you can work from anywhere, maybe try a home swap for a month or two in a different state or country. KD – Have you done a home swap before? Any websites you recommend?